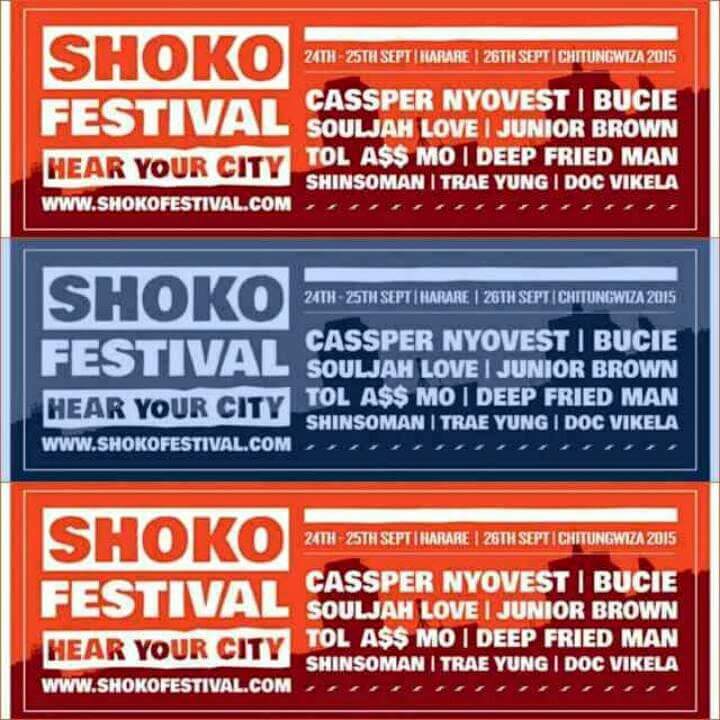 Zimbabwe is in for a treat from the 24th to the 26th of September as the evergrowing Shoko Festival roars into life in the Capital city Harare.Hiphop,spokenword and comedy will be in the spotlight with a number of foreign acts including Cassper Nyovest,Bucie and Tall A$$ Mo set to peform. Local hiphop fans will be glad to know Zimhiphop will take centre stage at the Harare museum as Jnr Brown,Trae Yung,Noble Stylez and BlackPerl are set to headline the show alongside their foreign counterparts tonight on the KingPinn stage.Soulja Love is also set to perfom adding an interesting aspect to an already exciting line up. As we speak the Rapcity fam are wrapping up their perfomance which started at 12 pm.Dj SenyoRitah is on the decks and the jechary boys Fly Legends are set to hit the stage together withTeysean,One nation,Bad Habit,Roragu at the Harare museum. From 1pm to 2pm today its the Big shots turn to prove their mettle on the same stage.They take their Can you Kick it experience with them with J-Nova,Savage and Kidd Active set to perfom. On Saturday the action shifts to Chitungwiza Unit L for Peace in the Hood which is going to be free.Besides the headline act Cassper rap fiends can expect Sharky to come through for the cultural mash up.Local beatmakers also go head to head in a beatmaking contest to decide who the king of Fruityloops is.Naborth Rizzla also brings Da grapevine rap battles to Chitown from 1pm till an unconfirmed time.